Despised by many American gardeners as a tenacious weed, purslane is not only edible, but exceptionally nutritious. It is high in Vitamin E and an essential omega-3 fatty acid called alpha-linolenic acid (ALA). 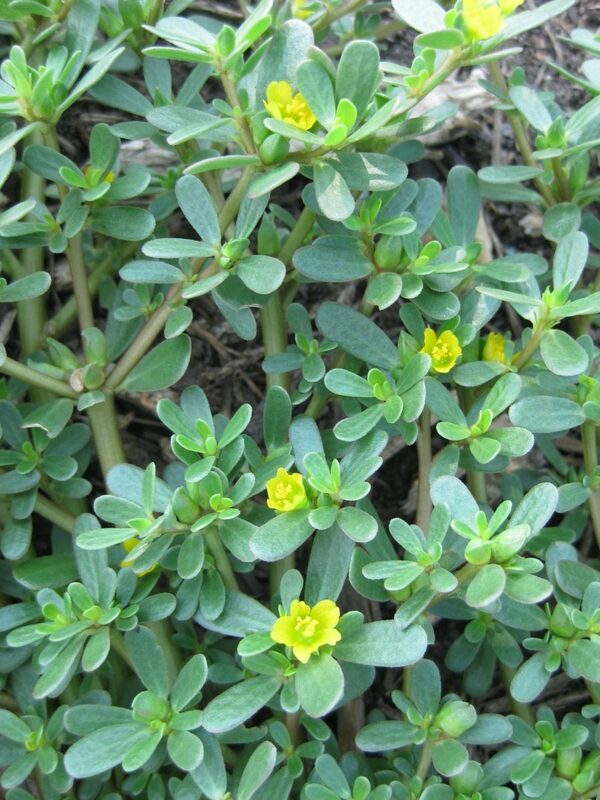 Purslane provides six times more Vitamin E than spinach and seven times more beta carotene than carrots. It’s also rich in Vitamin C, magnesium, riboflavin, potassium and phosphorus. Common purslane (Portulaca oleracea) is a low-growing, spreading annual plant with thick reddish stems and fleshy leaves. 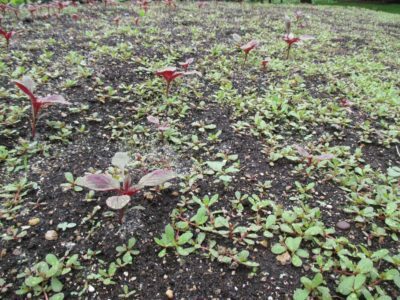 Wild purslane can thrive anywhere that has at least a two-month growing season. Because of its adaptability to a wide range of environments and its traditionally recognized health benefits, it has been a food staple across the globe, from Asia to Portugal, and from South Africa through the Americas. 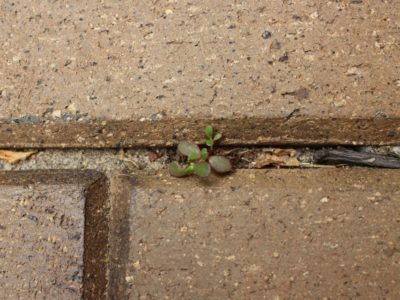 Purslane quickly sends out new roots when leaves or stem joints touch the soil, and savvy gardeners know they need to remove every tiny leaf and stem part or the plant will re-establish itself where it’s not wanted. If you’re pulling young leaves, and are sure they haven’t been sprayed with pesticides, set some aside to add a mild, citrusy flavor and pleasant crunch to your next salad. 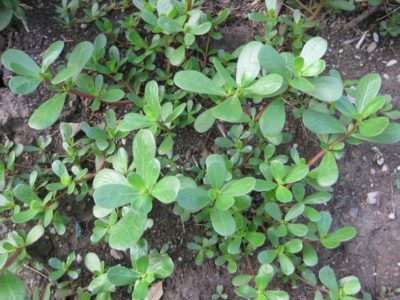 If purslane doesn’t already grow in your garden, don’t plant it there. Instead, grow it in a large, shallow container, such as a sandbox, where it won’t escape. And, NEVER put clippings into a compost heap. They will take root and spread. 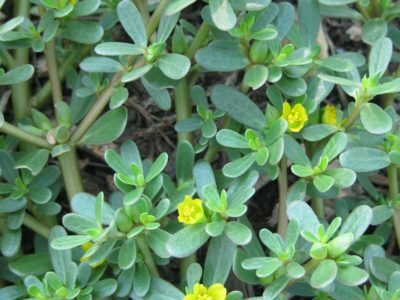 Cultivars, such as ‘Golden Purslane’ (Portulaca oleraceae var. sativa) and ‘Garden Purslane,’ developed with larger, more-succulent leaves and an upright stance, are sold by popular seed companies, including Baker Creek, Territorial, and High Mowing Seeds. Today, Americans are rediscovering purslane as a food. 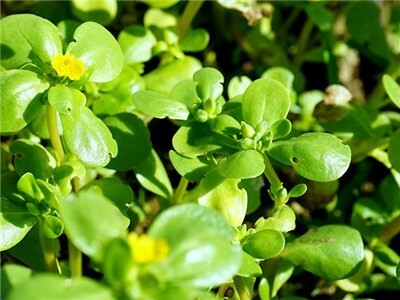 Menus of some up-scale restaurants feature purslane in salads, soups, and main courses. “Field-to-Table” proponents may include it as a nutritious green addition to the eating rainbow. Bloggers share recipes and preparation techniques, and scientists continue to investigate its nutritional and medicinal properties. 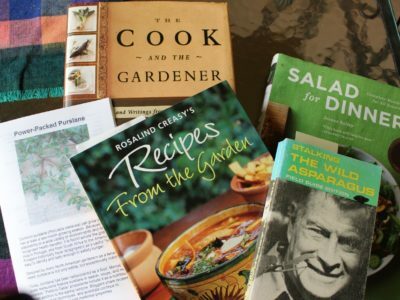 Recipes that include purslane are found in some cookbooks, including those shown below. The easiest way to prepare purslane is in a salad. For example, combine 1/2 cup of cleaned young purslane leaves with chopped cucumber and tomato; add a seeded and minced jalapeno chile pepper and 2-3 tablespoons of freshly-squeezed lemon juice. Sprinkle with a little salt to taste, toss, and serve. Rosalind Creasy, an activist gardener and author, who originated the term “edible landscaping” and has grown the domesticated version of purslane in her California garden (while also battling the invasive common variety), says that it “…is most likely a very nutritious green, and should be enjoyed more.” Here’s her recipe for “Pork with Purslane” which was suggested to her by some Mexican friends, and is rich and hearty. This is a classic Mexican recipe and the purslane can be substituted with nopales or chard and pork short ribs for the pork loin. Serve the stew with corn tortillas, and for garnishing; fresh salsa, chopped cilantro, and crema if you choose. Leftover stew is great the next day served with warm tortillas. On a hot comal [or cast-iron frying pan], toast the tomatillos, serranos, onions, and garlic until brown. Remove the seeds from the serranos and the skin from the garlic. In a blender, puree the tomatillos, chilis, onion, and garlic with the beef broth until smooth. Add the chopped cilantro and salt, stir, and set aside. In a heavy bottomed oven-proof pot with a cover, or a Dutch oven, heat the oil. Add the pork and brown over medium heat, about 15 to 20 minutes. (You probably need to do this in at least 2 batches.) Remove the meat from the pot and set aside. Sauté the onions and garlic in the same pot over low heat until tender. Add the tomatillo sauce base and bring it to a rolling boil, add the meat, cover the pot and bake in the oven for 30 minutes. Add the potatoes, cover and bake for 30 more minutes or until the potatoes are tender. Add the purslane and cook 5 minutes more. On a hot comal or dry frying pan toast the Mexican oregano for about 30 seconds, cool and crumble. Season the stew with the oregano and salt. Serve with the chopped cilantro. 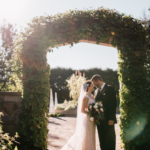 Photographs by Mark Dwyer, Director of Horticulture, Rotary Botanical Gardens, Janesville, WI, USA and Patrea Wilson. We encourage feedback and questions from you, our readers. 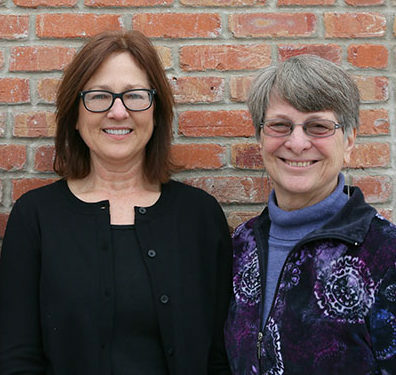 To contact Janice or Patrea, click here to send us an email. Patrea Wilson is a member of the Cottage Garden Gallery staff and has been a grounds volunteer at RBG. She has helped develop several of RBG’s exhibit gardens and always enjoys her time spent planting, weeding, and raking. ← Productive Despite the Drizzle!